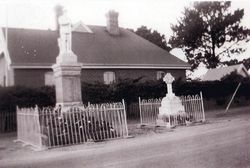 Sorell War Memorial commemorates those who were killed in World War One. The monument lists 26 names. Monument is a statue of a khaki coloured soldier, arms reversed but head unbowed, standing on a granite plinth. At Sorell on Saturday the district memorial to its fallen soldiers was unveiled. The scene was one similar to a score of others which have been witnessed in country towns in Tasmania since the war ended, but the pathos of it was no less evident for that. The memorial was unveiled by the State Commandant (Col. D. P. White), and associated with him on the dais were Hon. A. Hean. C.M.G., Mr. Thomas Hean, and Mr. J. Burge. The monument represents a typical Australian infantryman in battle kit standing with reversed arms. Upon the base are inscribed the names of Sorell's killed. The memorial is an excellent sample of the mason's and the sculptor's handicraft, and it reflects credit upon the contractor (Mr. Vimpany). The Mercury (Hobart), 6th March 1922. ERECTED BY THE RESIDENTS OF THE MUNICIPALITY OF SORELL. TO PERPETUATE THE MEMORY OF OUR FALLEN SOLDIERS.